With a fury that seemed vindictive, the Arctic wind howled outside the tent, shoving the minus 30C air through any crevice. Even a shelter designed for this trek to the magnetic North Pole could only cling tenuously to the vast frozen expanse where it had been pitched. Inside, huddled around a Bunsen burner, sat Paul Desmarais Jr., Chairman and Co-CEO of Power Corporation of Canada, the eminent diversified global management and holding company with annual revenues of $30 billion. His son and successor, Paul III, lay alongside him, ingesting a bit of the 8000 daily calories they needed to maintain their energy. Together, they reflected on the day’s torturous progress, part of a weeklong 125km march to the Pole last April. The INSEAD alumni had signed on to an excursion whose size was unprecedented. They formed part of a group that included 20 other executives, 12 military veterans, two Olympic hockey players, nine guides, and a documentary film crew. Also on the trip was INSEAD graduate and Chairman of the International Council Daniel Labrecque, MBA’81, President of Canadian investment bank DNA Capital. The adventure’s purpose: to raise some CAD$1.75 million for True Patriot Love, a foundation that helps Canadian soldiers manage the physical and psychological transition of returning home from battle. This fundraiser required participants to pull their own 100-pound sled and lug a 25-pound backpack across treacherous, windswept hardpack. An avid outdoorsman and a member of one of Canada’s most influential families, Paul Jr., 60, immediately agreed to join the odyssey when asked by its co-chair, Paul III, MBA’10J. The cause and challenge both appealed to him. Plus, this journey would be a great way for father and son to bond, especially at a time when Paul III was coming on board at Power Corporation to be groomed as his father’s eventual successor. There was a moment, though, as he watched the departing DC-3 that had deposited them 400km northwest of Resolute Bay—the middle of nowhere—that Paul Jr. thought, “What have I gotten myself into?” In the back of his mind, he’d held to the belief that the group could be rescued in an emergency. Now, the landscape’s desolation swept that notion away. “You can’t be rescued like that. Planes don’t land everywhere,” he laughs, adding that even their exit from the Pole was touch-and-go due to whiteout conditions. Alongside the physical hurdles were mental ones. At night, the group would share stories. Of course, Paul Jr. knew all the corporate war stories; those were battles he’d faced many times as his firm achieved sustainable earnings in the financial services, communications and other businesses, managing and administering assets totalling more than $1 trillion. But now he listened to soldiers’ accounts of horrors that they had confronted during actual war. “This was very difficult for us civilians,” admits Paul Jr., whose family’s military service dates to World War I. One commander had lost 25% of his troops to serious injury, PTSD, or death and he carried those scars. Another lost a leg and most of an arm in Afghanistan. He relied on the team to pull him on a sled. Another soldier suffered from PTSD, a result of working on a bomb squad; he couldn’t shake the feeling that an explosion would occur whenever he was in a room full of people. These stories made a deep impression on the Desmaraises, inspiring them to push even harder during the day’s hike, which could last nine hours. The trip’s highlight for Paul Jr. came during one of its toughest moments. He and his son were pulling the injured soldier on a sled, going uphill. One of the soldiers struck a deal with him: Pull for one more hour and then trade off at 4 p.m. Fine, Paul Jr., said. By that time, they would surely arrive at the summit. Four o’clock came but the summit didn’t, and so the soldier took over. He pulled for another 90 minutes before reaching the top. The expedition also reconfirmed for Paul Jr. that his son was ready to join the leadership of Power Corporation, founded in 1925 and transformed into a storied global entity by Paul Desmarais Sr. starting in 1968. Confidence is “the best gift a parent can give a child,” Paul Jr. says. He recalled his own father’s faith in him when Paul Sr. named him, at 42, Chairman and Co-CEO of Power Corporation in 1996. For his son, this moment of unconditional trust was enormous. It helped Paul Jr. earn his own numerous distinctions in business and beyond. 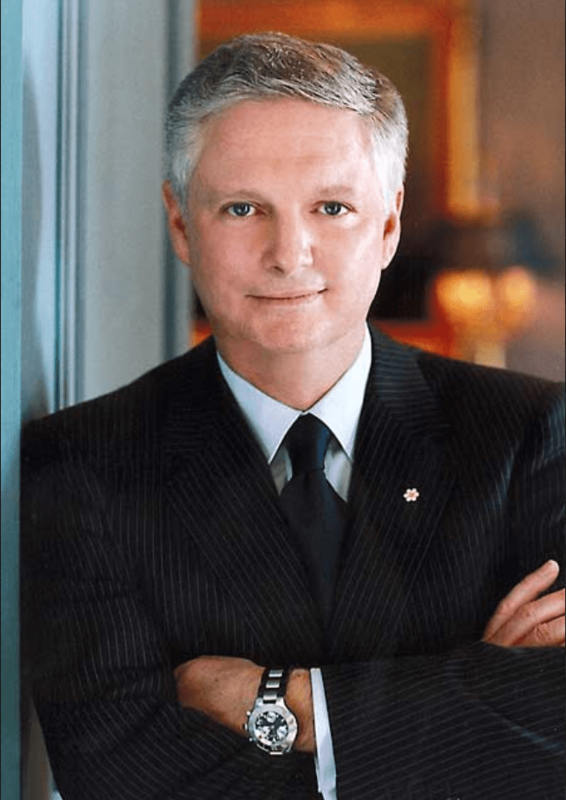 His contributions include exemplary corporate and board service as well as philanthropic work, resulting in being named an Officer of the Order of Canada, an Officer of the Ordre national du Quebec, and Chevalier de la Legion d’honneur. Paul Jr. says that INSEAD also proved transformative for his leadership journey. “INSEAD to me is the dream school. It changed my life,” he says. “Before enrolling in the MBA programme at 24, I was very North American, and a very aggressive young man. Perhaps too much so.” INSEAD’s curriculum and culture helped “round out” Paul Jr.’s edges, he says. Though his INSEAD board service and financial support, Paul Jr. helps ensure that others benefit from the school’s knowledge, too. A man whose mind embraces both philosophy and religion, he calls education the engine of progress, one that helps prepare us for life’s volatility. Even to enjoy it. “Humans have a hard time with change,” he says, citing the challenges of globalisation for many in the developed world, even as market integration has benefited untold millions in emerging economies. But change also removes us from our comfort zones, he says. If we cultivate a positive mental outlook, the world is our to embrace. It’s been nearly a year since INSEAD rolled out its enhanced MBA curriculum, which means that the first students to experience it have just graduated.